This tutorial provides you with a foundation for working with Adobe InDesign text formatting. It is the third lesson in the Adobe InDesign CC Digital Classroom book. For more Adobe InDesign training options, visit AGI’s InDesign Classes. This lesson covers the essential capabilities for importing, formatting, and flowing text using InDesign CC. You will work with several files from the id03lessons folder in this lesson. Make sure that you have copied the idlessons folder onto your hard drive from the included DVD. See “Loading lesson files” in the Starting up section of this book for details. This lesson may be easier to follow if the id03lessons folder is on your desktop. In this lesson you will add text into your layout and import type created using a word processing program such as Microsoft Word. You will also use InDesign’s text controls to control text formatting as you create a layout for a fictitious magazine, Tech. To view the finished project before starting, choose File > Open, navigate to the id03lessons folder, select id0301_done.indd, and then click Open. Choose View > Fit Page in Window or press Ctrl+0 (Windows) or Command+0 (Mac OS). After reviewing the layout, you can keep the lesson open for reference, or close it by choosing File > Close. You’ll use InDesign’s Typography workspace for this lesson. From the Workplace Switcher menu, choose Typography. 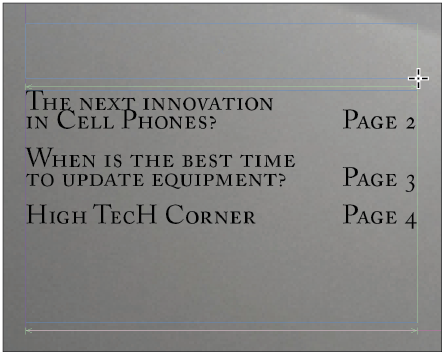 Text in an InDesign layout is always contained within a text frame. You can create text frames using the Type tool or use any of the other frame or shape tools to create an object that can easily be converted to a text frame. You can also add text into your layout that was created using other programs, such as Microsoft Word. Creating a frame is usually the starting point for adding text to a layout. You’ll start by using the most efficient way to define a new text frame: clicking and dragging with the Type tool. You will start by creating a new text frame and then enter text into the frame. 1 Choose File > Open. In the Open dialog box, navigate to the id03lessons folder, select the file id0301.indd, and then click Open. You’ll start by working on the first page of this document. If necessary, double-click the page 1 icon in the Pages panel to navigate to this page. The lower-left section of page 1 has a listing of the stories featured in this issue. You will create a text frame above this box and add text to it. If necessary, use the Pages panel to navigate to the first page. to create a new frame. 3 Type Inside this issue: into the text frame. If you need to reposition the text frame, choose the Selection tool () from the Tools panel, then click and drag the frame to move it. You can also use the frame handles to adjust the size of the frame. When using the Selection tool, you can switch to the Type tool () by double-clicking a text frame. 4 Choose File > Save As. In the Save As dialog box, navigate to the id03lessons folder and type id0301_work.indd in the File name (Windows) or Save as (Mac OS) text field. Click Save to save the file. When drawing a text frame, pressing the right-arrow key one time will divide the text frame being created into two linked text frames. Pressing the arrow key a second time will create a third linked frame. You can continue to do this until you have the desired number of frames. Similarly, pressing the up-arrow key divides the text frames vertically into separate frames. You can divide a frame both vertically and horizontally to create a grid of text frames. This can also be used when creating image frames or other shapes.